It seems as though once we solve one health crisis, another one emerges. According to a recent poll commissioned by Research!America, obesity is the fastest rising health concern in the minds of Americans. Childhood obesity is especially pressing, because overweight children are at higher risk for heart disease and stroke, diabetes, asthma and certain types of cancer. 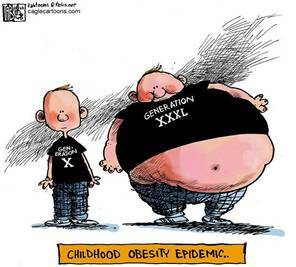 Public health interventions have been developed to top and prevent the childhood obesity problem. The World Heart Federation has been urging soft-drink makers for the past year to remove sugary beverages from schools. The group is looking to fight a rise in childhood obesity, which can lead to diabetes and other ailments. In the last few weeks, Pepsico and the Coca Cola company have announced a new initiative to remove full calorie sodas from schools. Instead, they will be replaced with lower calorie options such as diet sodas, waters and juice with no sugar added. Of course, stopping childhood obesity isn't as simple as just removing sugary drinks from schools. Children must become more active. Studies have shown that fewer children are walking to school because of safety concerns and increased usage of other forms of transportation. In response to these findings, communities have started walking school buses. A walking school bus is a group of students walking to and from school with an adult supervising them. The primary goal of the walking school bus is to and make walking to school safe, but it also hopes to reduce rates of childhood obesity by increasing a child’s physical activity in a day. Since childhood obesity has gained so much national attention, Michelle Obama has taken this problem as her platform during her time as the First Lady. In February, she unveiled the Let’s Move campaign joins together public health and medical professionals along with schools and families to fight childhood obesity. Under this initiative, the American Academy of Pediatrics will help ensure that pediatricians and family practice doctors regularly monitor children’s weight and even write a prescription for parents laying out the simple things they can do to increase healthy eating and active play. The Let’s Move campaign is also working with public health policy makers to ensure that children receive more nutritious meals in school and have better information on the importance of healthy eating to put them on track to a healthier life. Hopefully, by bringing continued national attention to the problem of childhood obesity, we can drastically improve the health of children today and in the future. This is Part 3 of 5 in our Intersection of Medical Research and Public Health series. Part 4 - HIV/AIDS: From Death Sentence to Chronic Disease?